School education - State awards 2017 - Communication of Selected Best Teachers on the eve of the Dr. S. Radha Krsihanan, Former President of India on 05.09.2017. All the District Educational Officers in the State are informed that, the following Teachers have been Selected for State / NFTW Awards - 2017 . 7 Wanaparthy Sri Mohd. Basheer Ahmed, School Assistant (Bio. Science), ZPHS (B) Amarchinta, MP Amarchinta, Wanaparthy District. 14 Jangoan Sri Syed Hashmatullah, Drawing Master, Govt. High School, Jangaon District. 1 Jangaon Sri B. Ramdan, Headmaster, ZPHS Mallampally, MP Palakurthy, Jangoan District. 2 Mahabubnagar Sri V. Vijaya Bhasker Reddy, GHM, ZPHS Narwa, MP Narwa, Mahabubnagar District. 4 Rajanna Siricilla Sri D. Venugopal, School Assistant(Phy. Science), ZPHS Garjanapally, MP Veernapally, Rajanna Siricilla District. The above selected teachers will be honoured on the Occasion of Teachers' Day i.e,, on 8th September, 2017 at 10.00 AM with a Gold Coated Silver Medal, a Shawl, Cash Award of Rs. 10,000/- and a Merit Certificate in the Ravindera Bharathi, saifabad, Hyderabad. He/She is therefore requested to instruct the selected teachers to report to Sri S. Brugumaharshi, Joint Director (Ser.) FAC of this office on 07.09.2017 @ 04:00 PM and also there is a interaction session with Hon'ble Dy. C.M and Minister for Education at Dr. MCR HRD Institute, J. Hills, Hyderabad at 6 PM and Dinner Follows.The selected teachers will be paid T.A. and D.A. as per T.S.P.T.A. Rules. They are requested to attend the State Awards Function to be held on 8th September 2017 at 10.00 A.M. at Ravindra Bharathi, Saifabad, Hyderabad. 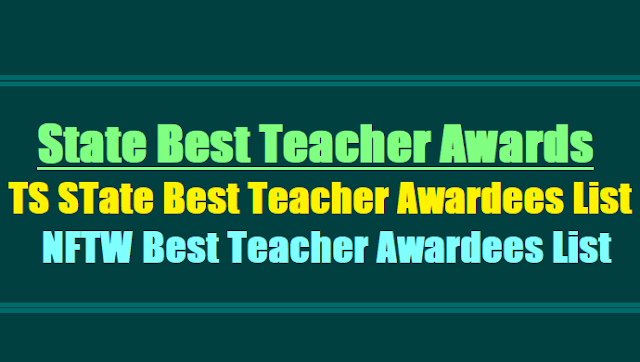 He / She is also requested to treat the absence of the above teachers for the Award functions as on duty. The receipt of these proceedings should be acknowledged.